The AGC Supervisory Training Program (STP) is designed to meet the specific needs of the early-career construction supervisor. 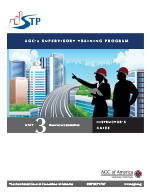 The Heavy/Highway Construction Supervisor Overview Unit, 3rd Edition, describes the value of effective supervision of workers to improve the supervisor's abilities. This Participant's Manual, designed as a workbook for students to follow along with the course and use as a reference guide, leads participants through course discussions and activities.